Audit review to determine if the Provincial and District Administrations expended PSIP and DSIP funding and Function Grants in compliance with the PF(M)A and Finance Instructions and to improve service delivery within the province and district. to improve service delivery within the province and district. of the PSIP and DSIP. health, education, transport, primary production and village courts. transactions which will be passed to relevant authorities for further investigation. no further checks were conducted. extremely difficult and generates uncertainty as to how much funding has been received. sectors if evidence of receipt of the funding is not provided. of building and maintaining infrastructure in different Districts. same level of services as other Districts for the same level of funding. Districts this does not occur. plans to reflect changing conditions or priorities within the province or district. development plan and the projects actually authorised by the JPP&BPC or JDP&BPC. Finance Instruction 1A/2013. However, old DSIP Trust Accounts have not been closed. expenditure that should have been funded from the Open Member’s Discretionary Budget. services delivered at provincial and district level. of service delivery infrastructure in the form of a police station and a health centre. will benefit from the investment. the quality of service delivery at sub-national level. aware of the purpose of these funds. current needs of the Province or District. verifying payment data to test compliance with funding purposes. continuity of projects in the following year. practices that addresses their recordkeeping responsibilities. every year from 2013 onwards under a combined Services Improvement Program (SIP). provinces, and also includes constituency or open MPs. at that level and as a result, funds expended by LLGs have been excluded from the review. and Kavieng and Namatanai in New Ireland Province. • Compliance with the requirements of the Finance Instructions and the PF(M)A.
to Government are also relevant and were taken into consideration. Administration to manage the funds. Alotau District which noted and agreed with all findings. minutes of the JPPBPCs could not be produced. could not provide PGAS reports on DSIP revenue for 2013.
significant items paid for in 2013 from DSIP funds had not been delivered. review, therefore the district was not included in the review. Term Development Plan (MTDP 2010-2015), DSP (2010-2030) and Vision 2050.
forwarded to DIRD together with the relevant Project Formulation Documents. including procurement procedures, and to ensure value for money. functions including administration, less the anticipated revenue of the Province. province has delivered 100 per cent of the function grant allocated against the KPIs. to the OLPGLLG and further decentralized administrative functions to the district level. school infrastructure development is carried out at the provincial level. evaluate and prioritise the development projects documented in the Development Plan. plan which recognizes the sometimes changing need of the Province or District. distributed directly to Local-level Governments. National Agencies such as DoF, DoT and AGO to perform fairly well. volume and type of traffic. due to the need to have goods brought in from Alotau or other major ports by sea. educational institutions within Alotau to cater for the District’s educational needs. Administration using casual labour and DSIP funding. the intent of DSIP funding. generators are used extensively to provide power to the few businesses on the island. extensively on Misima but no water tanks had been purchased. population growth rate from 2.3% in 2000 to 2.2% in 2015 and 2.0% in 2030.
to adequately assess, prioritise and approve projects. reconcile with the lack of suitable timber on the island. roads in and around their villages while road maintenance is badly needed in other areas. projects were for the construction of classrooms for two schools at a total cost of K450,000. school classroom projects, was for K2 million spent on pest control. funds so that the bank would open the agency again on the island. prioritising, approving and implementing projects by the JPP&BPC. had just two infrastructure projects underway which had been started but were incomplete. indication of weaknesses within the Administration. College was used to pay school fees for selected students. • K35,200 paid for the retrenchment of public servants. 2015 had not resulted in any projects actually starting. • K22,450 in potentially fraudulent payments were noted. transactions for the first six months of 2013.
prefabricated or built to a basic design). educational institutions for school fees for individual students. hydro power plant but it fell into disrepair and was replaced by generators. held) could not be produced. to assist with planning and monitoring of DSIP expenditure. further details of irregular transactions are at Appendix 2.
data on funding allocated to the provinces and districts but to date this has not occurred. inconsistencies with Function Grant expenditure. that is, key financial records for the first six months of 2013. 2.37 A high level of compliance with the PF(M)A was observed at Alotau District. for significant purchases and falsely claiming a sole supplier status to avoid going to tender. by allowing the market place to set the price. the project and did not conduct a proper assessment for additional funding. Finance Instructions and the PF(M)A.
sighted and ownership documents were not provided for review and examination. facilitated through a Contractual Agreement between the concerned parties. obtained as required by Finance Instructions and the PF(M)A.
K928,000 were not provided for verification. Details are provided in the table below;. 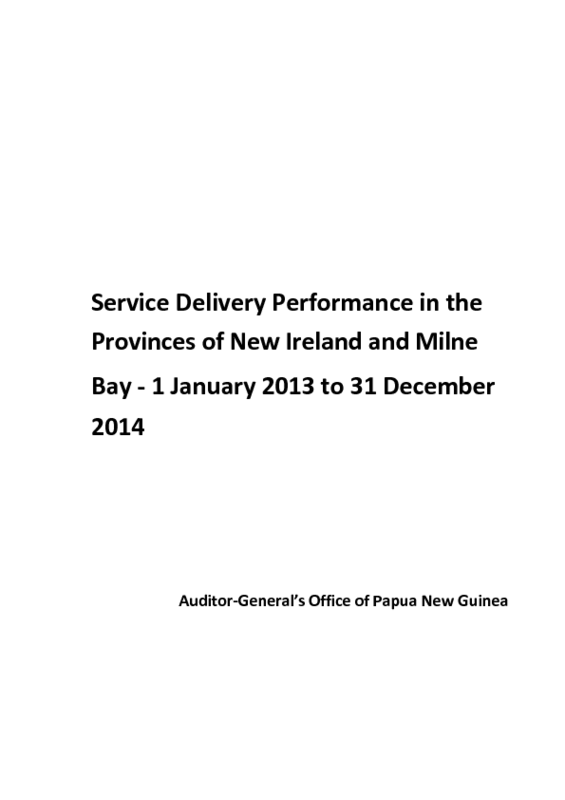 safe keeping of the financial records by the Milne Bay Provincial Treasury . .
expenditure for transport and fuel. quotation of K36,000 provided by another shipping company. purpose, as there was no acquittal report from the officer . allocation the review noted a payment of K11,570 for site clearance from DSIP Education. funding constraints in other areas. service delivery standards through the re-establishment of basic infrastructure and facilities. rooms or teacher housing under the Education sector as this would have a lasting benefit. overtime payments. K28,660 of this amount was expended by the Open Member’s Office. Administration’s decision to manage the project themselves appears to have been sound. provided small hand-held tablets and internet access to Year 12 students within the District. guaranteed a revenue stream for the term of the agreement. mobile phone carrier should have been explored. project. However this should not have been expended under the Law and Order sector. refurbishment of infrastructure and the socio-economic activities described above. avoid review or competitive selection, can be a strong indicator of corruption. were split to avoid competitive selection processes. necessitate an open tender process managed by the Provincial Supply and Tender Board. a clear breach of procurement procedures. the payments that were made. Officer to do logistics for the Member’s patrol with the District Administrator to Murua LLG. record of delivery or receipt of the goods. showing the maintenance carried out or identification of the vehicles maintained. contracted to Iwaky Agro Consultancy Services. payment of K5,000 and not the payments of K15,000 and K10,000. capping. Two quotations were included in the supporting documentation for this payment. On 19 December 2013 K423,860 was paid to Kingstown Holdings Limited for roofing iron. this amount requires three written quotations. payment of K148,000 was subsequently paid on 20 December 2013.
supported by only two written quotations. attempting to circumvent established procurement procedures. purpose of operating the MV Samarai-Murua. Murua) and a payment of K25,000 for medical repatriation also paid in September 2013.
the re-establishment of basic infrastructure and facilities. had been included in the 2013 DSIP Budget and approved by the JDP&BPC. quotations were received. Procurement of this value requires three written quotations. without the appropriate written quotations is a breach of procurement requirements. an annual budget to cater for medical repatriation. repatriation of the body of a deceased person should not be funded by DSIP. termites for the hospital building. cheque was in payment for treatment for the Kiriwina High School. Goodenough however no response was received. evidence that the payment was reimbursed. meeting held on 19 November 2012.
does not reflect an investment of K84,115 of DSIP funding. as the Internal Auditor had given him until the end of December to rectify the matter. number of payments be made from DSIP funding. church for them to manage the construction. and that the projects are delivered as planned. funds to be reimbursed at a later date, but the reimbursements did not occur. Member receives a discretionary budget which should be used for this type of expenditure. be financed by DSIP funds. specify the services that will be performed as part of the contract. Bay at the Holiday Inn on 30 October 2012.
money. This is not a suitable activity to be financed by DSIP funds. were obtained for the lap tops however the supplier was not the lowest quotation. Finance. This is an inappropriate allocation of DSIP funds. amount however this was not financed from DSIP funds. Administration and the agency reopened. goods. Three written quotations should have been obtained for procurement of this value. the responsibility of the District Administration. Examiner requesting instructions from the Member as the payment is not related to DSIP. but should be better managed. but to process the payment. had been discussed and approved at that meeting. from Toitop Pharmaceuticals Ltd. and that this matter has not been pursued. selected wharf construction sites on Kiriwin Island for a fee of K165,000. 2013. There is no mention of a wharf. solar lighting kits for Kiriwina Goodenough for distribution to all villages in the electorate. of the project was K280,000. The submission states that two quotations were received. procedures and represents poor value for money. carries risks that the projects will not be delivered to standard. people who reside within the Province. quality and rejected as unsuitable for use in the construction of the buildings. to the absence of financial records. which will mean funding to other programs under DSIP will be reduced. K55,193, of which K29,309 was also from the Transport Infrastructure Function Grant. the area on their way to a meeting with the Governor. benefits a select few individuals and does not improve service delivery to the Province. deliver Infrastructure developments that will serve the wider population for years to come. to the schools and payments to service providers are shown below. the schools. However, the cheques were cashed. out for years 2013 to 2015 to determine the extent of the bogus claims. a decline in service delivery to the Province. is affected when funds are spent on non-PSIP related expenses. requesting K300,000 to bring earthmoving equipment from Simbu to Kavieng via Lae. FYDP, the Annual Plan and Budget and JDP&BPC prioritization and approval. Finance Instructions pertaining to DSIP or to documented procurement procedures. and conducting feasibility studies on potential areas for project development. was decided that the proposal would be considered when funds became available. management of not exceeding 30% of the total funding. public tender would be required. represents a breach of the PF(M)A and the relevant Finance Instructions. three projects stated on the invoice is K580,000. managed in accordance with the requirements of the PF(M)A and Finance Instructions. purpose of the original cheque was for the Epo Police Station. JDP&BPC minutes provided to the review. installation at the health centres was a prioritized initiative. valuations should be attached to the documentation supporting the transaction. On 05 April 2013 K90,000 was paid to Fujianabure Ltd in payment for a training program. been presented for any transactions from this account. Letter but has not been produced. additional K90,000 was subsequently drawn to pay for delivery of the vessel. mentioned in minutes of the JDP&BPC during 2012. Management Letter but was not provided. ensure the validity of the payment. available. Further information is required to ensure the validity of the payment. lack of accountability and transparency. and Budget do not make provision for payments to piggeries. stipulated by the National Government’. DSIP funds will be expended without reference to the FYDP, as required by the rules. Anniversary in Kavieng. However, there is no itemized list of goods provided. investigation of these payments is required. providing ongoing benefits to the District. the effect that they been pressured by the administrator to pay this claim. as configuration and setup and resource training. months at a total cost of K400,000. referred for further investigation by the Auditor-General’s Office. invoices showing the number of litres purchased do not square with the amounts paid. produced to account for the fuel usage, the rate of supply or the cost per litre of the fuel. These payments also require further investigation. payment has not been made in accordance with the requirements of the PF(M)A.
K50,000 whilst the contract and invoice indicate that the project cost was K100,000. However, the District Administrator was unable to explain the difference in costs. Payment to Buenas Trading Ltd.
refers to the allocation of an amount of K600,000 for the Namatanai Town Plan. unaware of any such development being planned for the District.